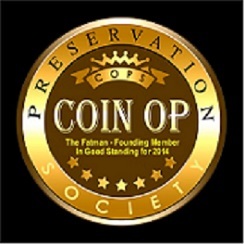 CoinOpCollectorForum.com • View topic - . . . stumped! I have NO clue what it is! Re: . . . stumped! Looks to be what Aristocrat might have done to a Mills slot... but for actual info ... Anglo British will be your best source for info that is correct. o.k. you guys want to break the news to them ? state it's posted here ,where collectors & dealers alike are talking about it. to bad the mechanics was replaced by a Mills one , might be worth having (not at this price). o.k. edgecity ,now it's priced to buy. actually a nice looking cabinet / castings ,ect. and if it actually works with the mills mechanics in it, good. she's worried it's really a boat anchor ,she'll never get rid of. Interesting coin entry ,looks to be a partial goose neck !!! JHSS-1944 wrote: o.k. edgecity ,now it's priced to buy. actually a nice looking cabinet / castings ,ect. and if it actually works with the mills mechanics in it, good.
" As I've said in the description, the lever pulls and the mechanics move, the wheels turn a little bit but not as they should. 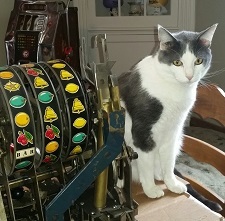 I can't move the wheels by hand, and I don't wish to damage the machine. I'm sure this unit is gonna need work to be in good working order. I have no idea if the jackpot payoff works or not. 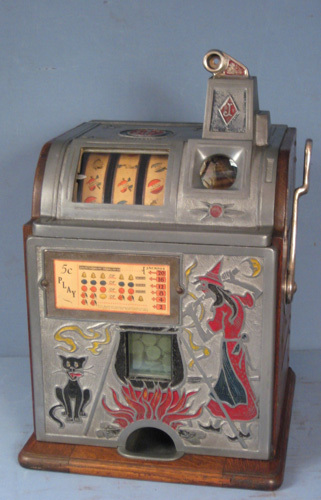 I really don't deal in slot machine, just picked this on up on a whim." It's an oddball, alright. Mech looks kinda beat but the reels look relatively new. Doesn't 'work' -- sounds like a clock problem, perhaps. Is it mech out of a HiTop or an 'M' Head? Funky coin entry -- looks like they may have pitched the escalator and fabricated a new chute. Weird payouts, too (e.g., Bells/16, Plums/12 . . .). The Fatman was right, this is right up my street, this machine was made by Bill Hooper in the U.K, Hooper took over from Tom Boland who revamped many of the early Mills machines in the early 1950's, both Boland and Hooper built wooden cabinets for people like my late father who travelled the British fairgrounds (Carnivals) on a weekly basis, sometimes having to carry the very heavy Mills cast iron machines from their Lorries (Trucks) to their stalls (Booths) on the carnival, so by using the Bolands or Hooper wooden cabinets that were much lighter was a great improvement, I know because as a young man I had to carry these machines also, sometimes through muddy and slippery conditions, my father also had wooden cabinets made and installed Jennings "Little Dukes" mechanisms in them. Aristocrat modeled their Arcadian models after the Hooper machines, also Jenning modeled their British "Penny Comet" models also after the Hooper models (See pictures), I have the original English Old pennies that were used by Jennings to test their payouts on their "Penny Comet' models.
. . . wow -- what an aMAZing story! So is the front of the cabinet also wooden? Do you know how the coin mechanisms were fabricated? Did this machine come back to the USA at some point and get revamped into a nickel machine? Man -- this is fascinating! nice to know it was a real revamp to sell the machine , not a basement Frankenstein marriage. but still just enough "not so" professionalism to be seen in the photos. if you could shave off a bit on the price .... wouldn't be so bad to buy.